Thanksgiving with friends in France is getting to be a ritual now that I’ve been here for three celebrations. Remembering the first time we got together to enjoy the holiday — that’s not really French — puts tears in my eyes. This year’s dinner for twelve at my place welcomed some of the same friends as the first and many who are new to me and to our town — Brits, Americans, Swedes and French. My world is growing bigger and better every day. Happy Day of Thanks to you all! Not Your Holiday? Celebrate Anyway! This season I’m learning a lesson from my new friends in France. If it’s not your holiday, celebrate anyway! Wouldn’t the world be a wonderful place if, instead of fussing about what to call a holiday, we’d just celebrate it together? Spending Thanksgiving in Uzes this year showed me just how that might feel. As we stood around the kitchen in a circle, holding hands — just as my own family has done for years — we all had something in common. We were all thankful. No translations needed. It’s not easy finding the ingredients for an American holiday meal in this part of France. Yes, we did have a turkey. It took a little doing, but we had one. And it was fresh… like in live. The Turkey – Yep, one evening just before dark Geoffrey called and said “time to get the turkey.” He picked me up in the blue van (which I’ve named the “Blue Devil”), and we took off down the road to pick out a live turkey. I’m still thinking about that. 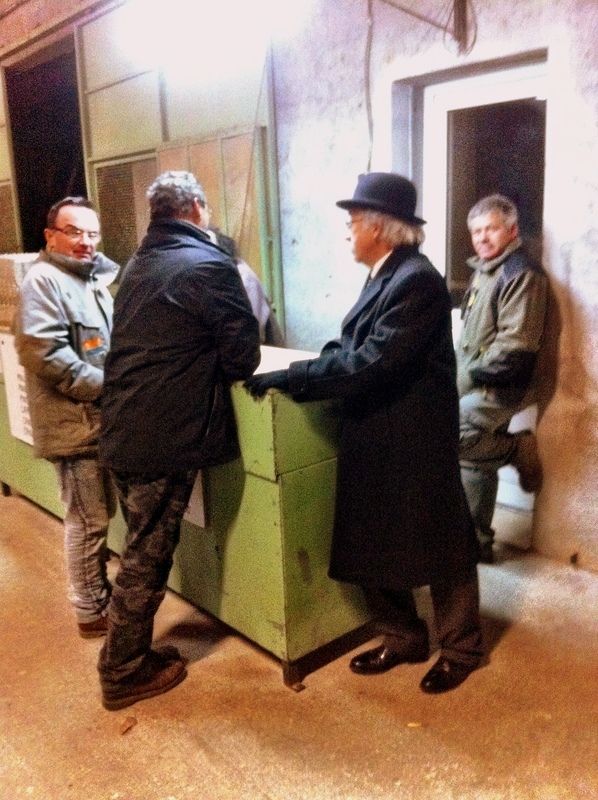 When we arrived at the poultry farm, it was much like a warehouse. 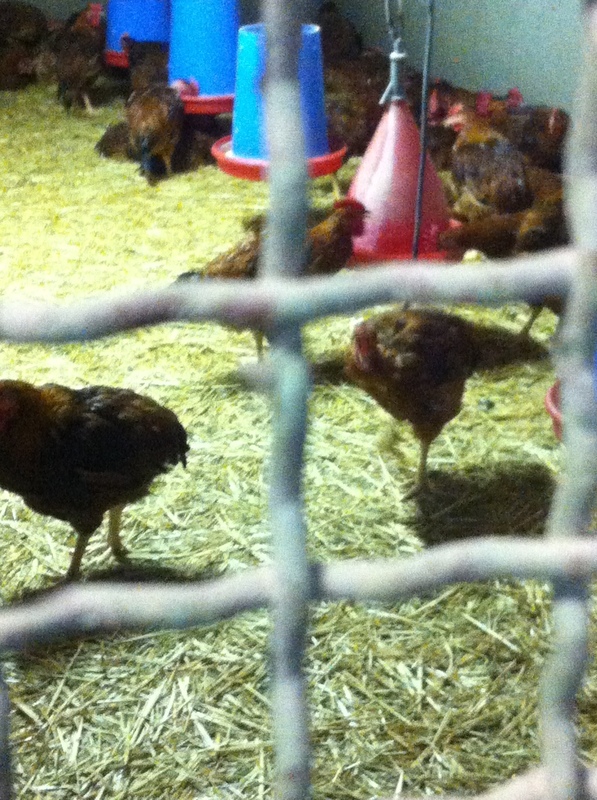 All types of fowl were running around in very well maintained cages and they had plenty of space, food and drink. I looked for the turkeys. None were to be seen. There were lots of chickens, geese and rabbits, but no turkeys. I took a big sigh of relief, thinking we would stop by Carrefour for a nicely packaged chicken. Just when we were getting ready to get back into the Blue Devil, a man came from behind us with a turkey in his hands. Ugh. He held her up for us to take a look, slammed her down on a scale big enough to weigh trucks, then threw her into a box. Geoffrey went off to “negotiate” the deal, then he put the box with the turkey in the back of the van and told me to “jump in”. On the way back to Uzes Geoffrey explained to me why things didn’t go as I was told earlier. 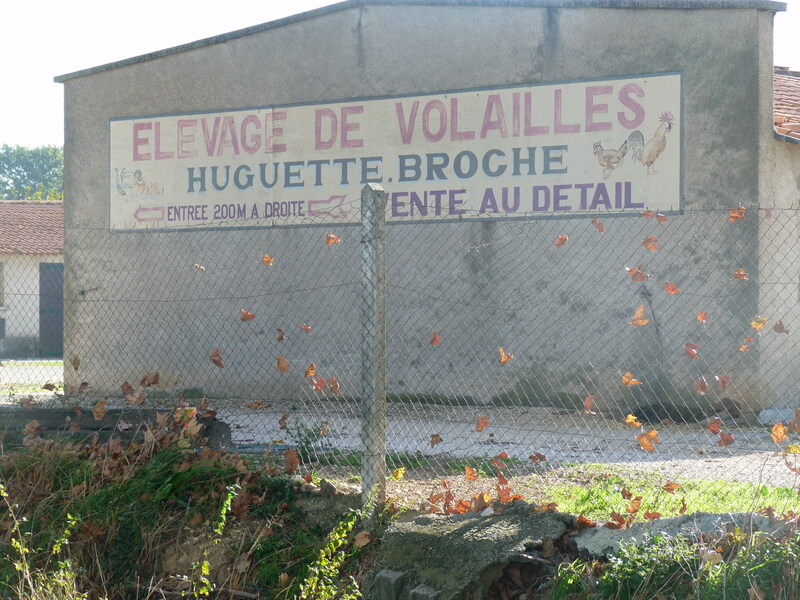 It seems there’s some “poultry edict” in France now that forbids live fowl from being killed at this type of facility. It has something to do with health requirements, I’m sure. 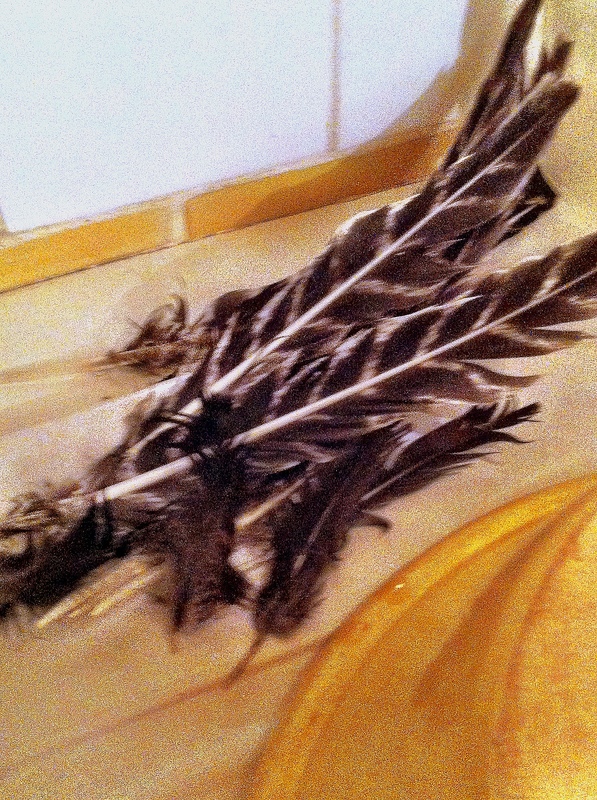 So it was up to Geoffrey to kill the bird and de-feather it himself. I’ll just say, he wasn’t looking forward to it. Shopping for oysters was left up to me. Or, better, it was left up to me to pick them up exactly where I was told to go — to Nimes and to Geoffrey’s favorite oyster man at the downtown market. Geoffrey was going to spend the day “preparing” the turkey. The market in Nimes is a colorful place. It’s on the ground floor of a multi-level shopping mall in a very fashionable part of town. The vendors are at the market until just after noon, six days a week. 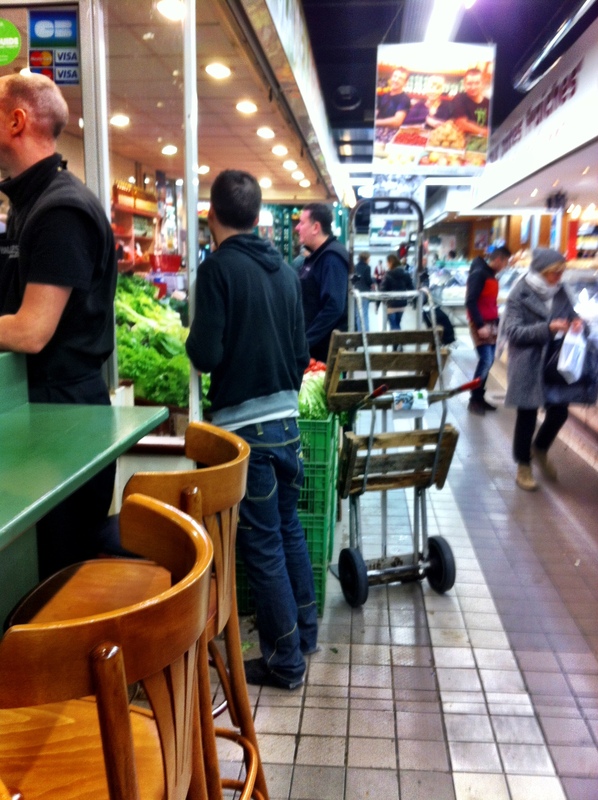 They sell mostly fresh food items, wine, olive oil and the like. 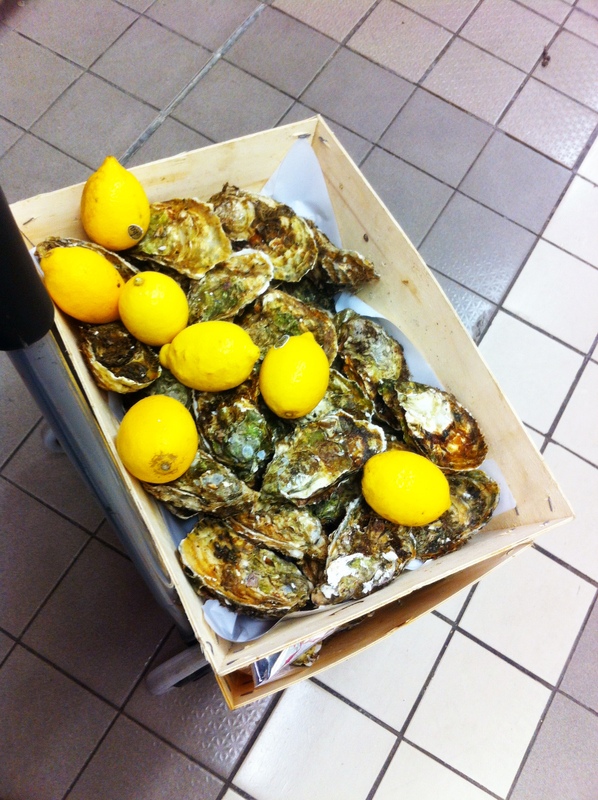 You can buy oysters that are from Sete (the Mediterranean) and some from the Atlantic Ocean. The selection of seafood, meats, cheeses and prepared specialties — like tapenades and pastries — is huge. Sally and I started out early for the 40 minute drive. I brought along a little cart with wheels so that I could carry the oysters to the car. There was no time to do any other shopping so Sally and I returned soon to Uzes with two crates of oysters — eight dozen of the most beautiful, fat and juicy oysters you can imagine. And yes, I did sample a few from the nice oyster man. The hardest items to find for the Thanksgiving menu were pecans and cranberry sauce. 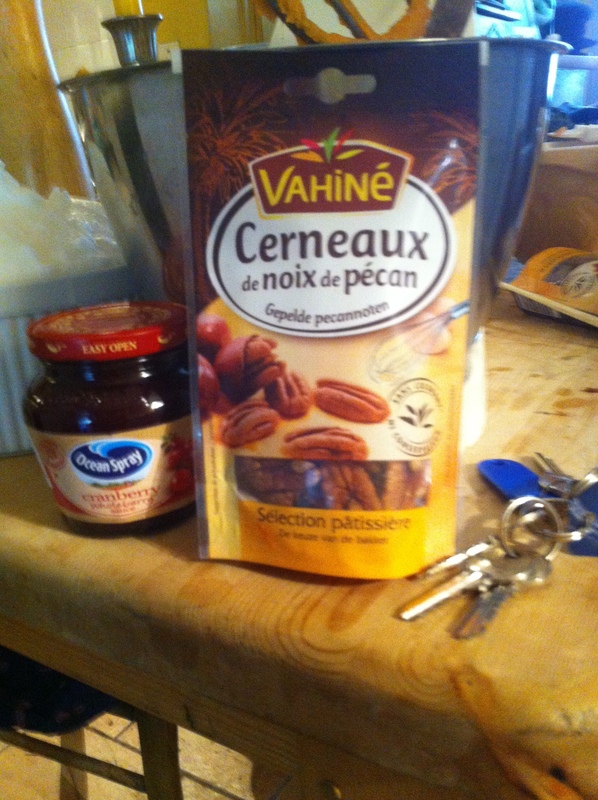 After searching through Carrefour for longer than you can imagine, I discovered them both. Guess where? You know the aisle in the grocery store where they keep all the “international” food. Should have looked there first, I guess. After all the planning, shopping and cooking –done almost completely by Geoffrey– it was time for Thanksgiving. Let me say no more. The pictures and video speak for themselves. Hi Deborah- Hope you had a happy Thanksgiving. The francophone quebecois, just north of here, call it l’action de grace. Counting down the days until we arrive. Can you give me the info on the oyster man!. Sète is not far from where we will be. Look forward to getting together with you. Hi Ken! Glad to hear from you! When do you arrive? Nancy can direct you precisely to the oyster man at the market in Sete. The ones in this post were purchased in Nimes at their indoor market. All from Sete. Look forward to meeting you. 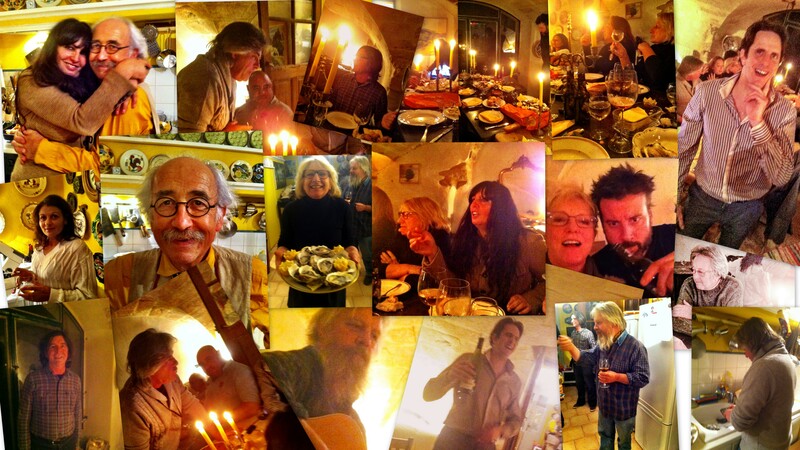 Thanks for sharing your global Thanksgiving…great food, great friends, great fun…beaucoup blessings! We are so thankful for our Autumn Adventure in Périgord and have followed many of your suggestions found in your Dordogne posts. We look forward to our closing week in France (Paris!) and then a much longer return in mid February…and hopefully an opportunity to meet you in person. Oh my! Perigord was wonderful! I definitely want to return because there are so many other places to visit. Glad the post helped you with your visit. And yes … please let me now when you’re nearby so we can have a coffee…I mean … glass of wine, of course! Looks like so much fun, I love doing slightly different things like this and introducing our French friends to different customs. Being British we don’t celebrate Thanksgiving either, but we do celebrate Boxing Day, the 26th December, and we always invite all our French friends round for a big midday meal, mostly leftovers and plenty of turkey soup, they love it! I’m hoping to get a taste of Boxing Day this year with Brit friends. Sounds like a great fun day. Thanks! Thanks, June. Please let’s get together when you return to France. I’ll hold down the fort. That would be fantastic! I’m off to research where is roughly halfway between Castelnaudary & Uzes!!! Perfect. I’ll meet you there! It was quite a feast and we enjoyed every minute and hour of it. Xo. Not sure who you are “someone” but I can guess! So happy you were here.